I had set my intention for this year – a year of daring greatly. I wanted to open myself to new learning and experiences. Mid-April, I came across information about a workshop that was being shared by two people I had been following and admiring from afar – Subha Nivedita and Subhorup Dasgupta. 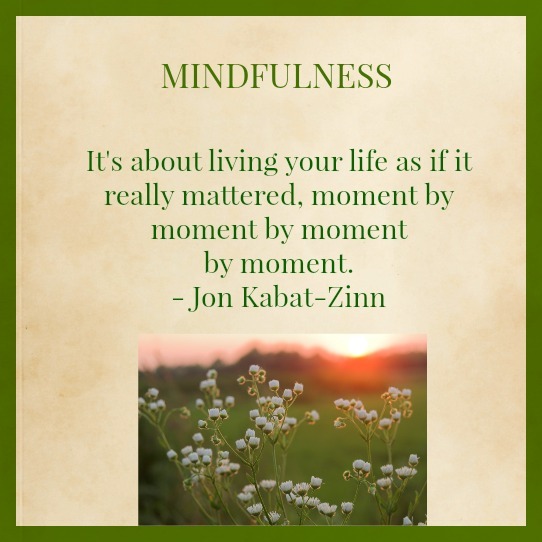 The Mindfulness for Intentional Living will help us look at how mindfulness of our inner world and our outer world can help clarify us, make us more creative, intentional and alive in our everyday life. Practice using different tools and fall in love with those activities you can use on an everyday basis. The programme was open to people who love to introspect, love to go on an inner journey and uncover their wisdom – anyone who yearns to live more creatively and mindfully in everyday life. I spoke to Jose and decided to attend the first day of the workshop. While he was quite sure I would go for all 3 days, I decided to dare carefully! By the first half of Day 1, I knew I was sold on the entire workshop! We set an intention for ourselves for the workshop and it was very interesting to have to answer that difficult question ‘What do I really want?’ Using collaging and intuitive painting, we began to get the answers from within ourselves. For me, the aspect of creative journalling, linked so well into my attempts at Julia Cameron’s ‘Morning Pages‘. Through the three days, using a variety of exercises and tools, including short meditations, the main facilitator, Aarathi Selvan introduced the whole aspect of mindfulness to us and how we can practice it in our daily lives. Simple yoga stretches – Selvan Srinivasan, introduced us to simple yoga stretches that could be done through the day to help one relax and become more mindful. Contemplative Photography – Mallika Rajkumar introduced us to the concept of Contemplative Photography and we had an interesting session of trying to capture pictures mindfully. More about this in another post soon. Drinking tea mindfully – I have been trying to get Subhorup Dasgupta to do a guest post here about his Blend of Tea venture. I was so happy to listen (and imbibe cups of tea) to him talk about the process of preparing and drinking tea and how we can bring mindfulness to this. (Subho did write a post – read it here). The participants of the workshop ranged from the age of 17 – 49 (almost 50, me!). I was so suprised at the openness and authenticity of each person attending and their willingness to listen non-judgementally to the others. To me it seemed that the Universe sent this programme my way, just when I needed it. Let me share with you some pictures from the workshop, courtesy Subhorup. That does sound interesting. I am glad you found the session enriching .. those pictures were great and that question – “What do I really want” is the most important one to ask ourselves. Where are we headed will come from there. Isn’t it? You are entirely too kind, Corinne. What an absolute pleasure it has been meeting and getting to know you! This has been a long time coming, Subho and I’m so glad we met too! Oh, what a marvelous experience this was, Corinne! Anything we do which helps us to be mindful of our inner thoughts and the lessons in the moment can never be a waste of our time. I’m reminded of the age-old practice of contemplative prayer in the Christian tradition. Blessing, my friend, and thanks so much for sharing! So glad you enjoyed the experience, Corinne! Looking forward to seeing your artwork! 🙂 That’s a nice slideshow. Did I see Bhavana Nissima in one of them – the group photo? Thanks Corinne! A profound reminder towards growing in authenticity which involves listening with a non judgemental attitude towards others,and learning to celebrate life moment by moment!! And it starts about being non-judgemental with ourselves, Damie. I can’t tell you how freeing that is! very interesting post and I was finding the facilitators name very familiar, looks like she was in sahayam before I came in…. Perhaps! I don’t really know.